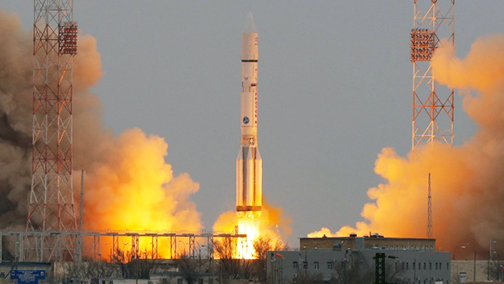 A Russian Proton-M rocket launch. A new news posting at the Advanced Television infosite by journalist Chris Forrester indicates that Russia’s TASS news agency has stated that the country will cut the cost of launching its Proton-M rocket to match the level of SpaceX’s Falcon 9 rockets. Roscosmos said it will cut costs by lowering expenses on ground-based preparations, Roscosmos Chief Dmitry Rogozin said. “Proton-M rockets are about at the level of Falcons by their price. Now we have taken steps to reduce the cost of launch services for us by cutting some expenses on the Center for the Operation of Ground-Based Space Infrastructure. That is, we can save funds on preparations for a launch,” the Roscosmos chief said. “We will restore the competitiveness of Proton-M rockets compared to Falcons,” he added.